The Poly is pleased to be involved in the knowledge transfer work being undertaken by Axisweb and MMU. Here is a link to further info and proudly features our photo. Steve and I were busy last friday, presenting our paper at this 2 day international conference. It was a beautiful sunny day and i believe Ruskin would have been proud as We spoke of the 'We are not an Island' project and our aims for this work. We learnt much of Ruskin and as ever when you are with him amazingly interesting people arent far behind. Highlights were for me the session on Memory and Loss and speakers Tino Mager [Architectural Historian] from Delft technical University, Ryan Roark [Architect] of Kohn Pedersen Fox and Bernard Richards of Brazenose College Oxford. All 3 showed and talked of contrasts and afterlifes of spaces and buildings. Steve's in Venice, here with Philiyda Barlows work in the GB pavillion and a new poster made for the trip - its our next offering to the city in response the ongoing We are not an Island conversation. While there he will meet with Emma Sdegno at Ca'Forscari and gift her the poster. We hope in return to hear her response. We are really happy with the discussions and prints that came out of the "How are we feeling" day at LPW last monday. What's not to love about bringing and anarchist, a celebrant, a newly redundant art lecturer, a recent graduate, a frustrated woman and a man who supports the cities less fortunate, amongst others together to have debate, make a print and learn a new technique. Supported by EMVAN we also enabled 2 artists to get paid in supporting the activity, bought new audiences into LPW and gave ourselves at the Poly an opportunity to grow further both the archive and new partnership and as one of the prints says - There's only us - come together! I was looking back to see if you were looking back to see if I was looking back at me. Pencil Crayon on Paper. 2017 - is now installed in the Ruskin Gallery within the Millenmium Galleries - Sheffield. Made as part of our "The Simple Stories they tell us dont make sense anymore" ACE funded project it will be on show until the new year. We are proud to continue the partnership with curator Louise Pullen and further build our relationship with Ruskin. The act of drawing eyes is to think of the circle of drawing, I look, my brain processes, a mark comes from my hand, the drawing appears. To draw the thing that makes this cycle possible is to bring attention to the act of looking and the notion of being seen. I look at the thing that looks, but these eyes are not real. They are beautifully pretending. Which focuses us onto ideas of honesty and beauty. I was moved to tears on seeing my uncles 2 new glass eyes fitted – fitted in part to ease our pain of witnessing his loss, a loss sustained in a farming related accident. They are exquisite prosthetics gems that ask us to reflect on the sublime reality of our own eyes and how they look, in every sense. I hope Ruskin would be proud and I hope this drawing which can never succeed in representing the subject fully, invites you to engage with life, living, with the act of looking and deep thinking. I know I am saved a little every time I take them out of their bag. 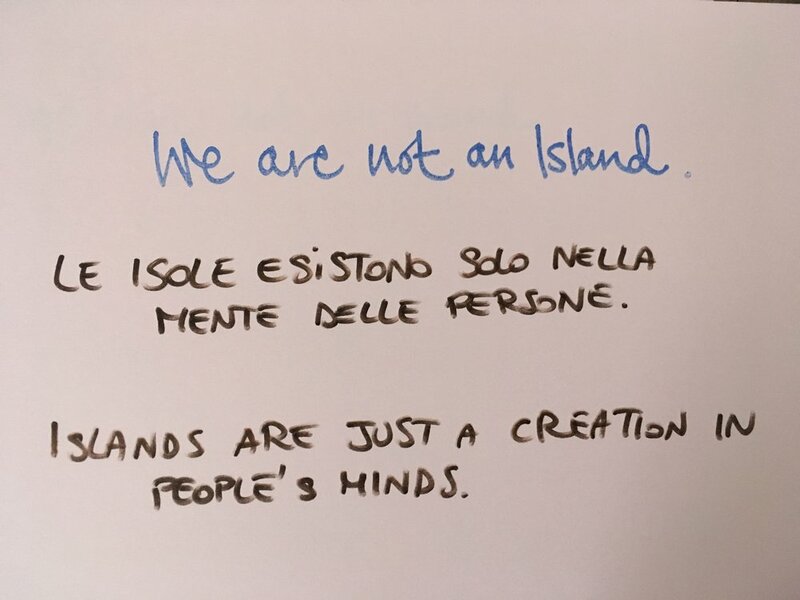 Happily 'We are not an island' - arrived in Venice at the begining of the journey to be met with a piece of graffiti that couldn't have been more apt and more Sheffield! In fact it was a week of meant to be's and happily the Poly has created some good starting links with an arts school, a screen print studio, some resident contemporary artist working as a collective - Blauerhase. I also developed further the working partnership between us and CaFoscari University, which has led to an exhibition now booked at CFZ, a university funded contemporary space opening on March 21 2018 and posters workshops for a variety of residents, school students, artists in February. During the week I also managed to fly post our recent poster across the city, deliver a lecture at the University and co deliver a presentations as part of the city wide event Venetonight. 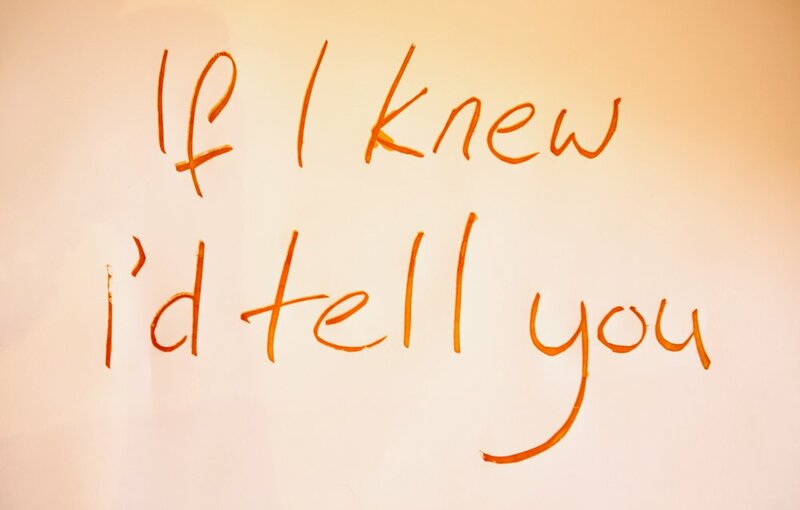 We've been invited to be stakeholders for Axiswebs new action research project: Models of Validation. More info on it can be found here. We are really pleased as it builds on the work we did with them for the publication Validation beyond the Gallery in 2016. Double Success! We are not an Island. 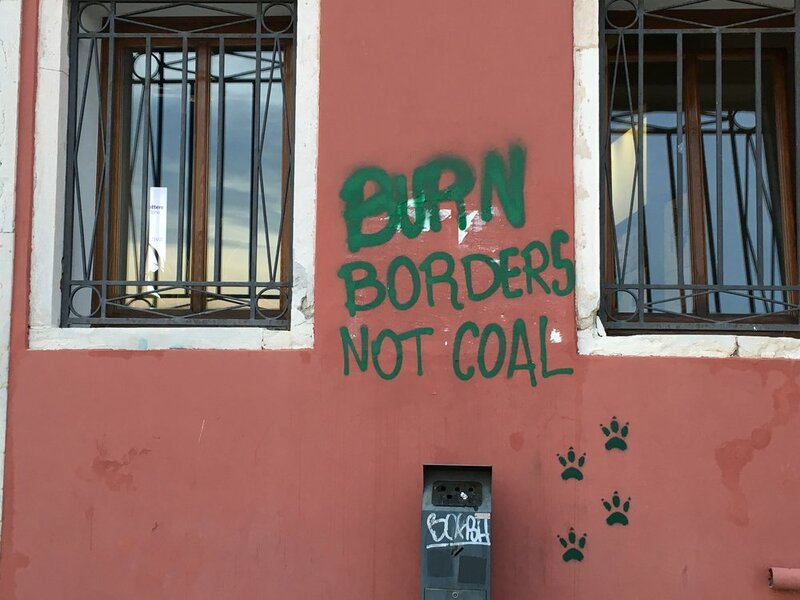 The Poly has been successful in being awarded 2 grants for 'We are not an Island' - one from The British Council International artist development fund and the other Making Ways Sheffield. Combined these enable us to take the YOU ME WE poster project to Venice, work with a range of Venetians, produce new work and exhibitions, be part of a symposium at Ca'Foscari university, bring a Venetian artist back to the UK to make work, do a projection in Sheffield and develop a pan European Audience for our work. We are excitied, happy and pleased to be building our practice beyond these shores, but also supporting artist making and networking in both the UK and Italy. We had a great time last week in West Raven meeting and talking and making posters with locals. Here are some shots from sessions, ad-hoc exhibitions and a few from the Saturday night projection in Catherdral square. In 1862 John Ruskin published Unto this Last. In it he raged against the destruction caused by industrialisation. In a way that valued our planet and our humanity. We have been commissioned By Peterborough Environmental City Trust [PECT] and METAL for thePLANET B festival. We are setting up and runing our Radical Print Workshop - YOU ME WE. Starting on July 29th and finishing Aug 11th, we aim to work with different groups and ask the question: What is of value now? Inspired as ever by Ruskin we hope to have interesting conversations, create minimally 40 prints and project twice on city centre buildings.